What is biosystems (or biological) engineering? The existence of this emerging discipline can be linked to the century-old discipline of agricultural engineering. A century ago, engineers trained in traditional disciplines having interests in agriculture, formed the American Society of Agricultural Engineers. Founding members of this society were driven to use their engineering education to remove the manual drudgery associated with the production of food. Thus, from its earliest beginnings, agricultural engineering was an application-based discipline (i.e., engineering fundamentals were applied to problems with production agriculture). In recent decades in North America, agricultural engineering has been transformed from an application-based discipline into the science-based discipline of biological engineering. As the name implies, this engineering discipline is built on a foundation of biological sciences and is intended to educate engineers who are able to apply their engineering education to a host of societal problems involving biological systems. This transformation has been widespread in the US, with many of the programs now using the name “Biological” (or “Biosystems”). Within the last decade, European universities began looking to the US to guide the transformation of their agricultural engineering programs (they tend to prefer the name of “Biosystems” Engineering). Do you know your Regional VP, Hugh Fraser? Hugh Fraser operates his one-man consulting firm called OTB Farm Solutions...Outside-the-Barn bright thinking for farming in the urban shadow. 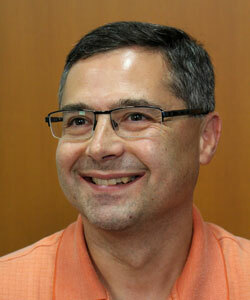 He works with farmers in the Greater Toronto Area dealing with rural-urban issues. For instance; defending a swine farmer against a dwelling severance next door, or as an expert witness at an Ontario Municipal Board hearing relating to normal farm practice. The next CSBE/SCGAB Technical conference and AGM which will be held in Guelph, Ontario, in July 2018. The conference will provide the opportunity to share professional research, experience and insights with colleagues from Canada and beyond. The conference is presented by the CSBE/SCGAB and will be held in conjunction with the 2018 Annual General Meeting of the CSBE/SCGAB. Precision Agriculture Team under Dr. Zaman supervision is organizing an International Seminar on: “Sustainable Smart Farming to Increase Farm Profitability and Mitigate Environmental Risks: The Need of the 21st Century” at Dalhousie Agricultural Campus, Truro, Nova Scotia. The seminar will be part of Dalhousie University's 200th anniversary. Please join the PA Team on March 15-16, 2018 to participate in the seminar. During the Fall Convocation on October 28, 2017, two M.Sc. in Biological Engineering students were conferred their degree: 1) Obiora Samuel Agu with the thesis “Microwave-assisted alkali pretreatment, densification and enzymatic hydrolysis of canola straw and oat hull”, and 2) Charley J. Sprenger (see photo) with the thesis “Classification and densification of municipal solid waste for biofuels applications”. Both students were supervised by Lope Tabil. Obiora is proceeding with his Ph.D. degree and Charley is currently working as Project Leader, Engineer-in-Training at the Prairie Agricultural Machinery Institute in Humboldt, SK. 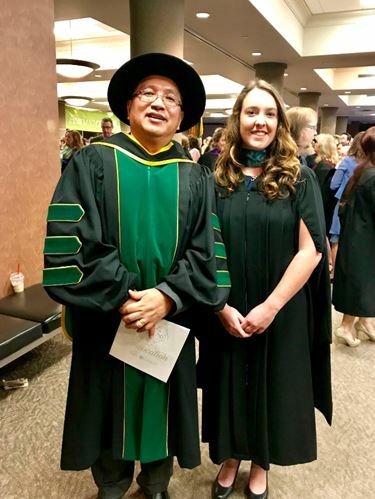 Charley Sprenger with her supervisor Dr. Lope G. Tabil during the Fall Convocation at the University of Saskatchewan.